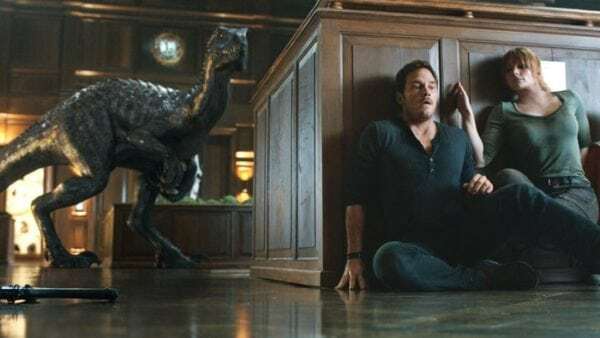 Jurassic World: Fallen Kingdom, 2018. 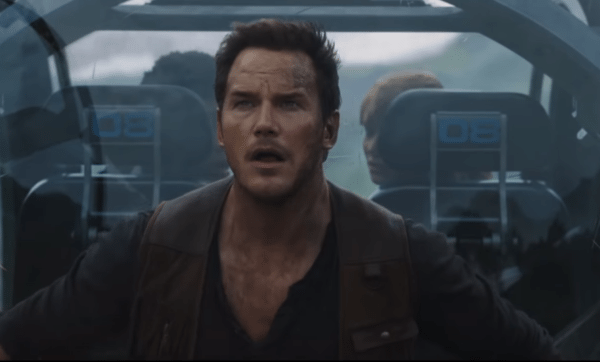 Starring Chris Pratt, Bryce Dallas Howard, Rafe Spall, Justice Smith, Daniella Pineda, Toby Jones, BD Wong, Ted Levine, Isabella Sermon, Geraldine Chaplin, James Cromwell, and Jeff Goldblum. Should dinosaurs be allowed to thrive? Should dinosaurs be genetically engineered for military purposes? Do dinosaurs deserve to live among us? Look, the script for Jurassic World: Fallen Kingdom (written by Derek Connolly and Colin Trevorrow, with the latter directing the hugely successful reboot) is loaded with intriguing concepts, but each and every one of them is setups with no elaboration, depth, or payoff. On top of that, there are some decisions made in the story that makes me think Trevorrow was smoking whenever he was on while penning The Book of Henry while writing this nonsense. Not that I take joy in someone losing their position/parting ways with a studio, but this is absolutely, unquestionably not the guy we want directing a trilogy capper for Star Wars. At least this sequel has a fantastic visionary director on board in J.A. Bayona (his most recent film A Monster Calls is one of the best features of the decade so far) to frantically salvage something, anything out of this baffling narrative. 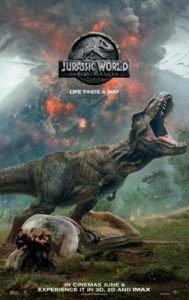 Jurassic World was a decent popcorn flick and a terrific way to reintroduce the once mega-popular franchise to a new generation, but I’m willing to bet that most people would tell you it’s one major flaw was flirting with the idea of dinosaurs potentially becoming weapons for the government. Unfortunately, Fallen Kingdom leans all the way into this concept, containing two factions; those that want to rescue the majestic creatures off the island from an impending volcano ready to erupt any day now (why the heck the owners would even build the amusement park near something so catastrophic in the first place is certainly a headscratcher), and generic gruff military walking tanks of machismo attempting to kidnap the dinosaurs (specifically the astonishingly intelligent Blue, who was raised by and formed an unbreakable bond with Chris Pratt’s returning Owen) for a wealthy individual (Eli Mills played by Rafe Spall) that is, of course, up to no good. Not to spoil anything (what I’m about to discuss happens within the first 20 minutes and is a development anyone with a working brain can see coming from a continent away), but Eli is a shady figure making nefarious moves behind the back of elderly billionaire Benjamin Lockwood (James Cromwell) who apparently has ties to Hammond, the man responsible for the original Jurassic Park. Cutting right to the point, dialogue and characters don’t mean a damn thing in this movie, so don’t expect much on that front with whatever connecting thread the filmmakers are going for; instead, he’s working for the family as a front with the guise that he is interested in moving the dinosaurs away from a second extinction to a sanctuary island. The doublecross doesn’t take long. 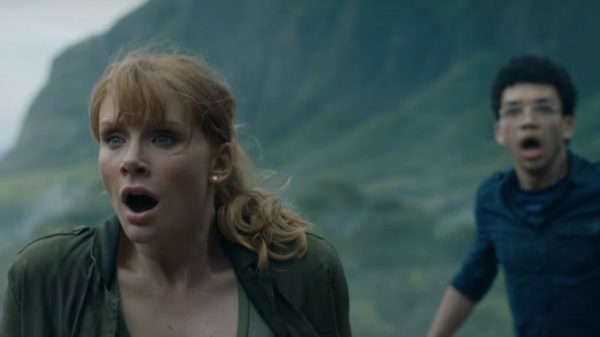 If there’s one semi-interesting character, it’s once again Bryce Dallas Howard’s Claire; opposite Chris Pratt who basically gets to crack jokes (although much less so this time around as the tone is far more of a straight-up action film with the typically expected family-friendly scares the franchise is known for) and take part in all of the destructive action, she is the only one that has to make serious decisions with moral consequences to weigh. Following the events of Jurassic World, she now runs an activist organization for animal rights specifically regarding dinosaurs, which is again, another aspect that sounds like a unique concept but is executed with nothing of merit. Along for the rescue mission are two new sidekicks from her group, one of which is a feisty medic (Daniella Pineda) that is very likable, and a frightened wussy played by Justice Smith over-the-top terrified any time he’s on screen. At least one of them is a worthy addition, but man, I really, really wanted to see Franklin get mauled and torn apart by dinosaurs before the characters even got to the destroyed island. Anyway, it’s also not long before the volcano erupts (you think these people would do away with procrastination considering how dire the situation is, but apparently not), and to Bayona’s credit he stages this (and all of the set-pieces) with precision and careful thought as to how each burst of peril will transition into the next. 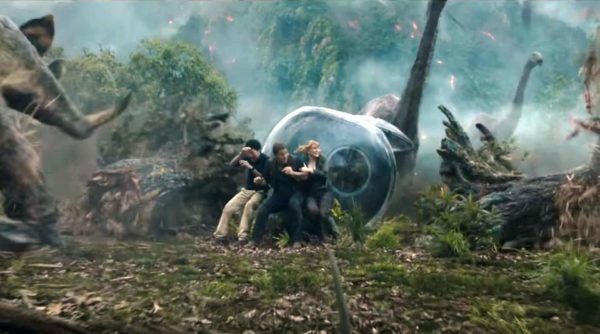 Basically, Bayona was game and obviously competent enough to direct this thing, but the special effects department has betrayed him as well as the writers; Fallen Kingdom is seriously one hideous looking blockbuster. I don’t even feel like complaining about little ridiculous bits such as Owen waking up from a tranquilizer dart just in the nick of time, regaining feeling and control of his body at the last possible second before death, all while visually unpleasant hot lava manages to creep up on him but avoids touching him altogether, because I still can’t get over how much the film (to be fair, it’s really only the first half as there is far less CGI once the story arrives at its mansion setting) is an empty, airheaded, cacophony of explosions. 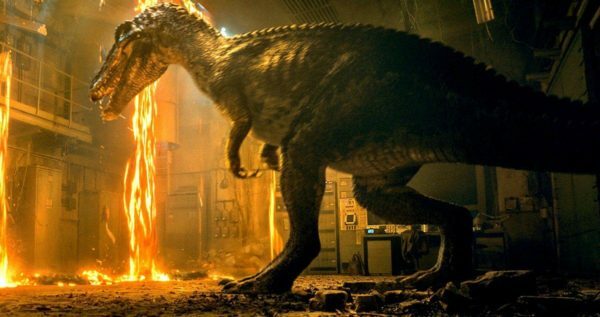 Thankfully, once the film becomes more contained it’s more about dinosaurs wreaking havoc and dispatching of enemies in various brutal ways, all while the protagonists do their best to hide and survive. Blue also gets some well-done one-on-one climactic action, ending the violence on an uproariously exciting moment. However, that first hour is completely devoid of tension and can’t even engage when Bayona defies the substandard CGI to create a few mesmerizing images involving the volcano catching up to some of the poor dinosaurs. The other reason the second half functions far better than the first is that the granddaughter of Lockwood, Maisie (Isabella Sermon) is placed into danger, and aside from being set in actual theme parks, the suspense is most present when there are children stuck in the thick of it. There’s a winning combination of a kid both being rendered speechless by seeing the creatures but also instantly freezing up in fear, which is something Spielberg mastered in the original and an aspect that Bayona pulls off here skillfully with a twist. 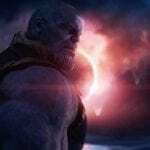 It also helps that Michael Giacchino’s score (which does include new ominous remixes of the classic John Williams theme) carries a sense of wonderment and adventure, especially during the final action sequences. Bearing that in mind, Jurassic World: Fallen Kingdom is yet another disappointing sequel not fixated on an amusement park. However, Jeff Goldblum does make a cameo appearance as Dr. Malcolm to open and close the story, teasing a tantalizing third film; it’s what I wished I was watching instead of this, and hopefully, Malcolm will have a bigger role in it. Let’s hope life will find a way to redeem Fallen Kingdom. Let’s not get too deep about it, it’s not going to win any Oscars nor is it trying to. Pass the popcorn and switch off for 90 min or so. ROFLMAO, didn’t you folks say similar nasty things about the first Jurassic World movie? I think we also had a couple of 4 star reviews.